DUMONT, GABRIEL, Métis hunter, merchant, ferryman, and political and military leader; b. December 1837 in the Red River settlement (Man. ), second son of Isidore Dumont, known as Ekapow, and Louise Laframboise; m. 1858 Madeleine Wilkie at St Joseph (Walhalla, N.Dak. ); they had no children but adopted a son and daughter; d. 19 May 1906 in Bellevue (St-Isidore-de-Bellevue), Sask. Gabriel Dumont is remembered principally for his role as Louis Riel*’s military commander during the North-West rebellion of 1885. Although some historians have endeavoured to portray him as a leader of broader scope, there is not much evidence to support such a view. He was the last and in some ways the greatest of the traditional Métis chiefs whose status was based upon prowess as hunters and fighters and extensive kinship networks. On the two occasions that he attempted to exert political influence beyond the circle of kinship, in the campaign for recognition of land rights in the early 1880s and during the agitation in Quebec after the rebellion, he failed to transcend his background. Unlike Riel, Dumont was never more than the head of the strongest faction of the Métis. 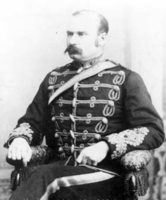 His military leadership during the 1885 rebellion exhibited the same combination of strengths and weaknesses as did his peace-time conduct. Certainly there would have been no rebellion without Dumont’s enthusiastic support of Riel. Once the fighting began he excelled in personal courage and impressive displays of tactical skill. But beyond these traditional features of Métis warfare he was unable to go, and the inexperienced Canadian militia defeated the rebel forces with unexpected ease. The founders of the numerous and powerful Dumont clan were Gabriel’s grandparents, a Montreal fur trader named Jean-Baptiste Dumont and a Sarcee woman called Josette “Sarcisse.” Josette had begun living with a man named Bruneau in the 1780s and had one child with him. Following the custom of the fur trade, Bruneau turned Josette over to Jean-Baptiste Dumont in 1794. Their first child, Gabriel, was born in 1795 while Jean-Baptiste was employed by the Hudson’s Bay Company at Fort Edmonton (Edmonton). A second child, Jean-Baptiste, followed in 1801. Around this time Dumont went to Lower Canada for about two years, passing Josette along to another trader named Paul Durant. When Dumont returned he attempted to reclaim Josette. Durant refused to give her up and Dumont took her back by force. The reunion produced a third child, Isidore, in 1808. After he came back to the west, Jean-Baptiste worked as a freeman, contracting for particular tasks at various HBC posts in the North Saskatchewan valley, for the rest of his life. Following the merger of the HBC and the North West Company in 1821 there was no prospect of employment for his sons, and Gabriel Dumont’s father and uncles all became buffalo hunters. In the early 19th century success in buffalo hunting depended upon the ability to build up kin groups large enough to defend themselves on the prairies. The elder Gabriel Dumont was able to do this, founding a community at Lac Ste Anne, west of Fort Edmonton, that numbered over 200 by the 1850s. His younger brother Isidore apparently found it more difficult to establish himself. After Isidore and Louise Laframboise were married in 1833 they moved east to the Red River settlement, acquired a river lot at St Boniface, and tried farming. Here in 1837 their third child was born and named Gabriel. The opening of overland routes to the south and the establishment of American trading posts such as Pembina (N.Dak.) created a new market for buffalo robes in the 1840s. Isidore Dumont was one of the first to take advantage of this opportunity, moving west to Fort Pitt (Sask. ), which was becoming the centre of the hunt. Here the family lived until 1848. They then returned to Red River, settling at White Horse Plain (St François Xavier), although the buffalo remained the mainstay of their existence. While barely into his teens Gabriel Dumont took part in the hunt of 1851 which led to a famous battle. About 300 Métis were attacked at the Grand Coteau of the Missouri by a much larger party of Yankton Sioux. The Métis decisively defeated the Sioux and inflicted heavy casualties for the loss of only one of their own men by protecting their horses and carts with a ring of rifle pits. This was Dumont’s only experience until 1885 of an armed encounter involving more than a handful of participants, and it undoubtedly exercised a powerful influence over his conduct of military operations in the rebellion. Few records of the Dumont family’s activities in the 1850s after Grand Coteau have survived. They seem to have drifted westward as the declining buffalo herds pulled the chase in that direction. In 1858 Gabriel’s mother died. Later the same year Gabriel married Madeleine Wilkie, daughter of the leader of the White Horse Plain hunt, Jean-Baptiste Wilkie. In the early 1860s Dumont emerged as the chief of a group of buffalo hunters whose headquarters lay in the area around Fort Carlton (Sask.). By 1863 there were about 200 hunters, enough to require some formal organization to regulate the chase. In that year Gabriel Dumont was elected leader, a position he retained as long as the buffalo lasted. The presence of a large, semi-permanent Métis population on the south branch of the Saskatchewan River attracted the attention of the Oblates of Mary Immaculate, who in 1868 sent Father Alexis André* to minister to the growing community. News of the Red River resistance of 1869–70 undoubtedly reached Dumont and his followers quickly. In later years he claimed to have gone to Red River, met Riel, and offered his services. The origins of this story seem more likely to have been in French Canadian nationalist mythology about the Métis than in fact, although Dumont may have come to believe it. There is no supporting evidence for it, and Riel’s failure to recognize Dumont in Montana in 1884 strongly suggests they had not met. The Métis communities of the South Branch absorbed most of those who left Manitoba in the aftermath of the troubles of 1869–70. The newcomers began establishing river-lot farms as well as taking part in trading, freighting, and the hunt. The changing economy of the region also had its effect on Gabriel Dumont’s way of life. To accommodate the increasing traffic along the Carlton Trail, in 1872 he began to operate a ferry across the South Saskatchewan six miles upstream from the one that François-Xavier Letendre, dit Batoche, started about the same time. The following year he marked off a river lot at the ferry site and built a house. When the HBC needed a large number of labourers to cut a road to its post at Green Lake in 1873, it naturally turned to Dumont to recruit men for the project and supervise the construction. These varied activities produced a modest prosperity for Dumont and for the community and enabled him to open a small store, complete with billiard-table, near his ferry. Settled communities with economies based on agriculture and commerce as well as the hunt made some permanent form of government desirable, if not essential. Since the government of the North-West Territories had not got around to making provision for local administrations, the Métis of the South Branch created their own. At the urging of Father André, Dumont called a meeting for 10 Dec. 1873 at the new church in St Laurent (St-Laurent-Grandin). The assembly elected Dumont president and chose a council of eight. Enforcement of their decisions was to be carried out by a body of “captains” and “soldiers,” the traditional organization of the buffalo hunt. A brief but comprehensive legal code was enacted, covering criminal offences, land ownership, contracts, and labour relations and establishing miscellaneous regulations for such matters as control of livestock. The council could impose a small tax and require corvée service for necessary public works. The assembly affirmed its loyalty to Canada and its willingness to disband as soon as the territorial government created its own institutions. Gabriel Dumont was re-elected president in December 1874. A few months later his government attempted to impose fines on several Métis who had ignored the rules of the buffalo hunt. These individuals complained to HBC factor Lawrence Clarke* at Fort Carlton. Clarke immediately wrote to Lieutenant Governor Alexander Morris* claiming that the Métis had established a provisional government and were in open revolt against Canadian authority. A detachment of the newly formed North-West Mounted Police under George Arthur French* was sent to investigate and it reported Clarke’s charges to be without foundation. The incident brought a virtual end to the government of St Laurent. The willingness of some Métis to flout the traditional laws of the hunt illustrates the growing crisis created by the disappearance of the buffalo. A successful hunt was still essential, given the precariousness of agriculture, and Gabriel Dumont was quick to see that when the buffalo were gone some kind of government assistance would be necessary to ensure the survival of the Métis. 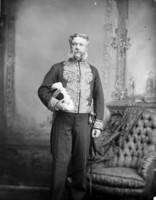 In 1877 and 1878 he chaired meetings that drew up petitions to the government asking for representation on the Council of the North-West Territories, farming assistance, schools, land grants, and confirmation of ownership of farms already occupied. In 1880 he led a successful protest against the territorial government’s plan to collect a fee for wood cut on crown lands. Then in 1881 Dumont and his followers once again petitioned for land grants and scrip. By 1882 it was clear that the buffalo were gone for good. The response of the South Branch Métis was to concentrate their political activities on demands for a river-lot survey of their farms apart from the square survey system. For them the issue had acquired a symbolic importance far beyond the merely technical matter it appeared to the government. If they were not to receive even the meagre assistance guaranteed to the Indians by treaty, the least the government could do in these times of change and insecurity was to guarantee title to lands already occupied. Ottawa had no intention of depriving the Métis of their lands, as the river-lot surveys carried out at other settlements such as St Albert attest. But a series of administrative misadventures resulted in a failure to carry out the right kind of survey at the South Branch. Government policy was to depart from the regular square survey and carry out river-lot surveys wherever such settlements existed. In Prince Albert a river-lot survey was done in 1878 and the surveyors started on the South Branch as well, completing about one-fifth of the work before the season ended. For reasons that have defied the efforts of historians to determine, the job was not finished the following year. Instead, the remaining parts of the South Branch were surveyed under the square system. The Métis wanted a resurvey into river lots according to the original plan. After several years of delay in publishing the plans of the survey, the government offered a cumbersome and difficult-to-understand method of registering existing river lots by legal subdivision. Gabriel Dumont was not one to suffer frustration quietly. Near the end of March 1884 he called a meeting at the house of Abraham Montour. To the 30 who attended Dumont recounted his failed attempts to move the government and suggested that Riel was the only one who could organize the kind of pressure necessary. He seems to have realized that there were broader issues that might unite whites and Indians as well as Métis, but he knew that he was not the one to exploit them. The meeting agreed that an invitation to Riel would carry more weight if it was made on behalf of the whole community. Dumont spent April travelling among the Métis settlements urging people to attend a joint meeting with the English-speaking settlers. Several hundred Métis assembled on 28 April and elected a six-man committee, one of whom was Dumont, to draft a bill of rights and represent them at the meeting with the English. Dumont and Charles Nolin would take the document to Ottawa after consulting Riel on the way and asking him to come to the South Branch. The joint meeting on 6 May rejected the Ottawa trip on grounds of expense and instead decided to invite Riel to come north and present their case to the government. Dumont, Michel Dumas, and James Isbister were delegated to go to Montana and make the approach. They left on 19 May and on 4 June reached St Peter’s mission, on the Sun River, where Riel was teaching. Riel had been in correspondence with at least two people from the Métis community and was not surprised to see the delegation. He agreed to return with them and by 5 July they were back at Dumont’s farm, where Riel and his family stayed before moving on to the village of Batoche the following day. Through the summer and fall of 1884 Dumont appears to have left matters entirely in Riel’s hands although he kept in touch with his activities. By February 1885 he and Riel had both concluded that negotiations with Ottawa had failed irrevocably. Dumont played a crucial role at this point. 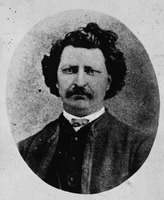 Without his strong and active support, Riel would not have persuaded the Métis to take up arms. At the beginning of March, when Riel proposed forming a provisional government, support from the English-speaking settlers and the church vanished. A secret meeting of eleven leading Métis on 5 March, however, took an oath that they would use armed force if necessary. Gabriel Dumont was a signatory along with four other Dumont kin. Some important Métis like Charles Nolin were starting to back away but Gabriel Dumont controlled a nucleus sufficiently large to begin hostilities. Dumont spent the next two weeks drumming up support among the Métis and the neighbouring Cree bands [see Kāpeyakwāskonam*]. On 18 March he encountered Lawrence Clarke, who told him that the NWMP were sending a large number of men to Fort Carlton with the intention of arresting him and Riel. This report set off the first overt action of the rebellion. Dumont, accompanied by 60 or 70 men, seized two stores, confiscated the arms and ammunition they contained, and took two prisoners. The following day at Batoche, Riel proclaimed the provisional government. Along with Maxime Lépine* and others, Dumont was made a member of the governing council or “exovedate” as Riel called it, and he was appointed “adjutant-general of the Métis nation.” He organized his small army of about 300 along the lines of the buffalo hunt and began preparations to defend the Métis settlements. In later years Dumont claimed that from the outset of the rebellion he wanted to attack the enemy wherever opportunities offered, starting with Fort Carlton and Prince Albert, but that he was constantly blocked by Riel. The minutes of the Métis council and the accounts of the other major participants all tell a different story. The council made strategic decisions as a group and there was a strong consensus that the territory occupied by the Métis should be defended, but no one, including Dumont, suggested attacks outside these boundaries. On 21 March Riel sent a letter to Superintendent Lief Newry Fitzroy Crozier demanding that he surrender Fort Carlton. For the next three days, however, the council refused even to allow Métis soldiers to occupy Duck Lake, a trading centre only six miles west of Batoche on the way to the fort. On 24 March the council voted on the matter and split six to six; Riel cast the deciding vote in favour of the move. After occupying a store at Duck Lake, Dumont prepared his defences against an expected NWMP attack from Fort Carlton. Early on the morning of 26 March a party of 22 police under Sergeant Alfred Stewart encountered Dumont and his men on the road to Duck Lake. There was a noisy confrontation and the police retreated. Later in the morning, under Superintendent Crozier, a much larger party of nearly 100 police and volunteers with a seven-pounder field gun headed back to Duck Lake. There was a brief parley but someone began shooting and the fight quickly spread. Dumont’s men outnumbered the police and volunteers about three to one and he sent them to outflank the enemy on both sides of the trail. The government forces were soon in danger of total defeat. All might have been killed or captured had Gabriel Dumont not suffered a slight head wound early on that prevented him from leading his men. He turned the command over to his brother Édouard but Riel, who ordered the killing to stop, kept the retreat of the police and volunteers from becoming a slaughter. Duck Lake was a clear victory for the Métis but at a high cost to the Dumont family. Gabriel’s brother Isidore and three other relatives were among the dead. The events of the next few days are controversial. The obvious military move was to capture the town of Prince Albert, defended only by some mounted police under Commissioner Acheson Gosford Irvine and the demoralized survivors of the Duck Lake fight, who had retreated there after abandoning Fort Carlton. In his 1888 account of the rebellion, Dumont claimed that he had urged this course but it had been vetoed by Riel. The only independent evidence from the period, the minutes of the Métis council, shows exactly the opposite. 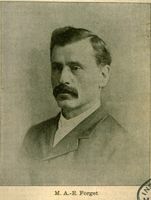 It was Dumont who on 31 March put forward a motion to withdraw from Duck Lake and concentrate on defending Batoche. An analysis of the rebellion reveals that the Métis fought only when the enemy actually crossed the boundaries of their settlements. During the next month there was a leisurely debate between Riel and Dumont over whether to concentrate all resources at Batoche, as Riel wished, or to extend the perimeter to the southern limits of the settlement, which Dumont had come to think was necessary. It is instructive that when Dumont believed it to be essential, as in this case, he ignored Riel. When Major-General Frederick Dobson Middleton*’s army approached the southernmost Métis farms, Dumont and most of his men were waiting at a place which they called Coulée des Tourond but which the soldiers were to call Fish Creek. Early in the morning of 24 April, Dumont placed his Métis, Sioux, and Cree soldiers in the ravine which crossed the trail to Batoche at right angles. Although they were outnumbered at least five to one, Dumont’s skilful dispositions and inspired leadership enabled them to drive off the attackers with heavy casualties. The victory, however, reduced even further the scant range of options left to the Métis. The loss of many horses deprived them of mobility, and the battle had used up much of their ammunition. Dumont took his men back to Batoche and began preparing defensive positions for the decisive confrontation. After two weeks’ rest the ponderous Middleton resumed his march on Batoche. On the morning of 9 May he attacked the positions Dumont had constructed. Dumont and his men resisted fiercely in the face of the enemy’s superior numbers and armament which included field artillery and a Gatling gun. They held off the government forces for four days but the outcome was never in doubt. On 12 May the defenders could hold out no longer and Batoche was captured. Gabriel Dumont remained at large in the vicinity of Batoche for several days. His wife and father urged him to flee, and when he heard of Riel’s surrender on 15 May, he decided to go. Accompanied by Michel Dumas, he left for the United States on 16 May via the Cypress Hills. The two crossed into American territory on 27 May and were immediately arrested by the United States Army. After only two days in custody both were released on orders from Washington. They headed for the Métis communities in Montana where Dumont had relatives. Efforts to raise money for a raid on Regina to rescue Riel came to nothing. In August a representative of William Frederick Cody attempted to recruit Dumont for Buffalo Bill’s Wild West Show. Although he was interested, he made no immediate commitment. Madeleine joined him at Fort Benton in the fall. Dumont did some hunting and talked of settling in Dakota but Madeleine’s death in the spring of 1886, probably from tuberculosis, removed any incentive to do so. Although the Canadian government included him in an amnesty later in the year, he had no desire at that time to return. In June 1886 Dumont accepted Cody’s offer, joining the show in Philadelphia on 7 July. Until the end of the season in September he toured the eastern United States, performing as a trick-shot artist with Annie Oakley and others. He returned for brief stints with the show in 1887 and 1888, but only as an extra. Living near the headquarters of the show on Staten Island, N.Y., Dumont discovered, or was discovered by, the large community of French Canadians in New York and New England. He began speaking before groups of them about his experiences in the rebellion. These contacts led him to others with French Canadian nationalists in Quebec who had come to consider the crushing of the rebellion as symbolic of the fate of their own aspirations and as a means of furthering their political ambitions. In April 1888 Dumont went to Montreal at the behest of Laurent-Olivier David*, president of the Association Saint-Jean-Baptiste de Montréal, and a group of nationalists to begin a lecture tour, but the first speech went so badly that the tour was cancelled. The audience expected someone with Riel’s sophisticated grasp of the relationship between theology and politics in Quebec. Dumont was bluntly critical of the clergy’s failure to support the rebellion. After a trip west to Montana, Dakota, and Red River, he returned in December to Quebec City where he dictated his account of the rebellion. From the time he left the city in the spring of 1889 until his death 17 years later, the details of his life are sketchy. He later claimed to have gone to Paris in this period but it seems extremely unlikely. In 1893 he was in Winnipeg to apply for land-scrip and after that returned to his old homestead near Batoche; he subsequently acquired the adjoining quarter-section by pre-emption. In this final stage of his life he let relatives farm his land. He built a small cabin on the farm of a favourite nephew, Alexis Dumont, and lived there. On 19 May 1906 he died suddenly while visiting Alexis, probably of a heart attack. Gabriel Dumont’s death passed unnoticed in the larger community. Twenty years earlier his name had been a household word in Canada but his inability to transcend the limits of traditional Métis leadership in the aftermath of the rebellion meant that, unlike Riel, he passed quickly from the public consciousness. From the end of the rebellion to the present, historians writing in French have attached much less importance to Dumont than have those working in English. Accounts by participants such as Charles Arkoll Boulton* and Sir Frederick Dobson Middleton paint Dumont as a fierce and determined opponent. Contemporary accounts in French pay little attention to him, perhaps because of his open hostility to the church. Even Marcel Giraud in his massive ethnographical study of the Métis sees Dumont only as the leader of a faction. G. F. G. Stanley recognizes Dumont’s limitations as a political leader but accepts at face value Dumont’s own account of his handling of the 1885 military campaign. George Woodcock’s biography attempts to portray Dumont as the greatest political and military figure produced by the Métis and therefore as more significant than Riel. But Dumont had no vision of the political future of his people remotely comparable to the dream of Louis Riel, and his military reputation depends largely upon conjecture about what might have happened had Riel not allegedly restrained him. An account of the rebellion attributed to Dumont in Adolphe Ouimet et B.-A. T[estard] de Montigny, La vérité sur la question métisse au Nord-Ouest: biographie et récit de Gabriel Dumont sur les événements de 1885 (Montréal, 1889), has been edited and translated by G. F. G. Stanley as “Gabriel Dumont’s account of the North West rebellion, 1885,” and published in CHR, 30 (1949): 249–69. GA, M477; M1395, files 4–5. NA, MG 27, I, C4. PAM, MG 10, F1. Provincial Arch. of Alberta (Edmonton), Arch. of the Oblates of Mary Immaculate, Prov. of Alberta-Saskatchewan, 71.220, item 3001; 84.400, V.-[J.] Grandin corr., Alexis André à Grandin; item 733. Saskatchewan Arch. Board (Regina), R-500.118 (St Laurent, RBMS) (photocopies). [C. A.] Boulton, Reminiscences of the North-West rebellions, with a record of the raising of her majesty’s 100th Regiment in Canada . . . (Toronto, 1886). Guillaume Charette, Vanishing spaces: (memoirs of a prairie Métis), trans. Ray Ellenwood (Winnipeg, 1980). T. E. Flanagan, Riel and the rebellion: 1885 reconsidered (Saskatoon, 1983). Marcel Giraud, The Métis in the Canadian west, trans. George Woodcock (2v., Edmonton, 1986). J. A. Kerr, “Gabriel Dumont: a personal memory,” Dalhousie Rev., 15 (1935–36): 53–59. Constance Kerr Sissons, John Kerr (Toronto, 1946). F. D. Middleton, Suppression of the rebellion in the North West Territories of Canada, 1885, ed. G. H. Needler (Toronto, 1948). Desmond Morton, The last war drum: the North-West campaign of 1885 (Toronto, 1972). D. [P.] Payment, Batoche (1870–1910) (Saint-Boniface, Man., 1983). G. F. G. Stanley, “The halfbreed ‘rising’ of 1875,” CHR, 17 (1936): 399–412. A.-H. de Trémaudan, Histoire de la nation métisse dans l’Ouest canadien ([Montréal], 1935). George Woodcock, Gabriel Dumont: the Métis chief and his lost world (Edmonton, 1975). Roderick C. Macleod, “DUMONT, GABRIEL,” in Dictionary of Canadian Biography, vol. 13, University of Toronto/Université Laval, 2003–, accessed April 24, 2019, http://www.biographi.ca/en/bio/dumont_gabriel_13E.html.